Logbooks are one of my favorite resources in the Archives & Special Collections. Logbooks, also known as student handbooks, were printed every year for incoming students. They often included a message from the university president and the ASUPS president, and outlined many aspects of social and academic life at Puget Sound. They included the student government bylaws, a social and academic calendar for the year, and descriptions of student clubs and activities you could join. They were printed for the entire campus, but were geared towards incoming first year students. Our collection of Logbooks ranges from 1916 to 2009. 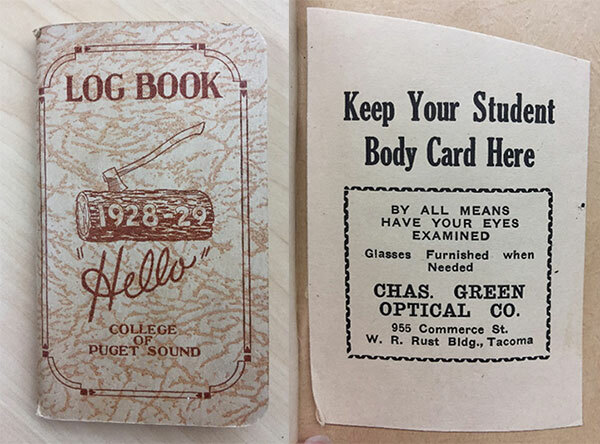 Throughout the decades the Logbooks evolve and they serve as a wonderful indicator of what campus life was like in the past. They give us a glimpse into campus traditions, social norms, and the administrative structure that influenced students’ lives. If you’re interested in investigating an aspect of campus life, the Logbooks are a great place to start!